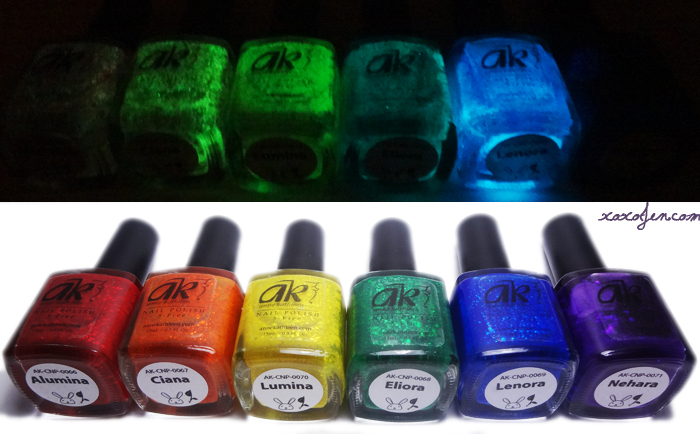 I was quite happy with the polishes I first reviewed for the AK brand but then Leanne sent this set and lemme tell ya, they're pretty flippin' awesome! These are jellyish glitter polishes that reach opacity in just 2 coats. The yellow is a little sheerer, but still just used 2 coats. Each polish dries semi matte, but when top coat is added they look like glass Christmas lights all lit up and glowing!! On top of this awesomeness, they ALL glow in the dark when charged up under a regular light-bulb (60W or higher works best) for a few seconds. How could these be any more perfect for the holiday season? I also noticed her labeling - she has a batch number for every polish, and this whole set is vegan and cruelty free. I've used AK's descriptions for each polish below. 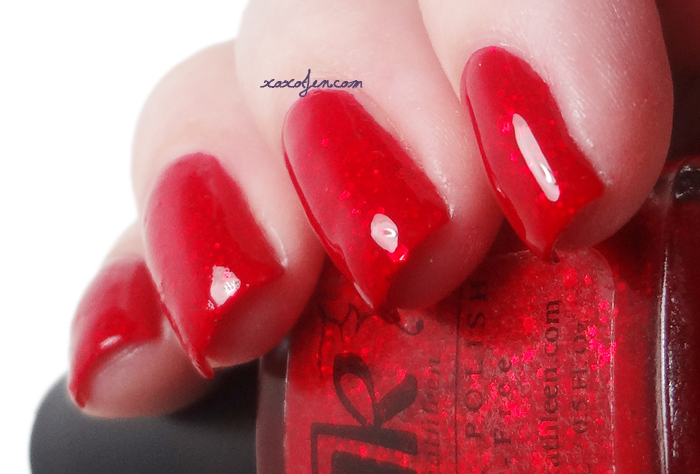 Alumina is a glow in the dark red jelly full of very fine, and small bright red glitters. 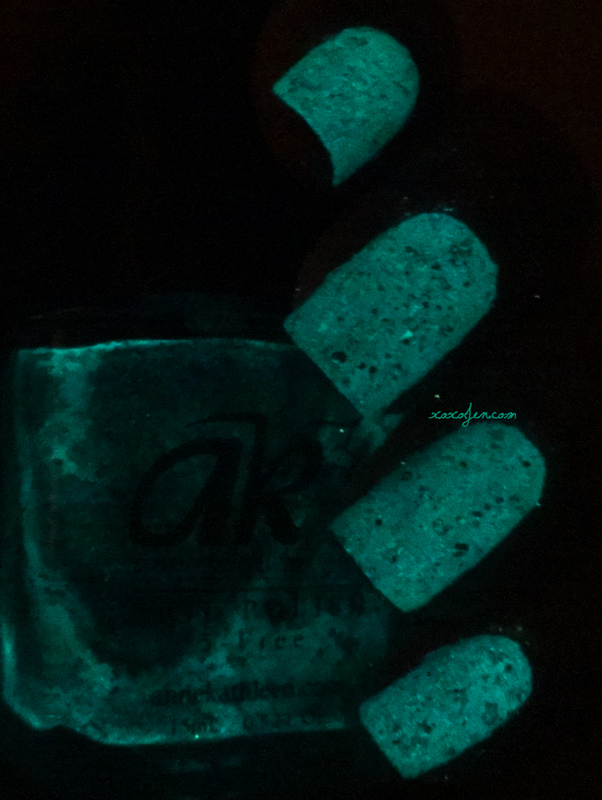 In the dark Alumina glows dark red after being charged. 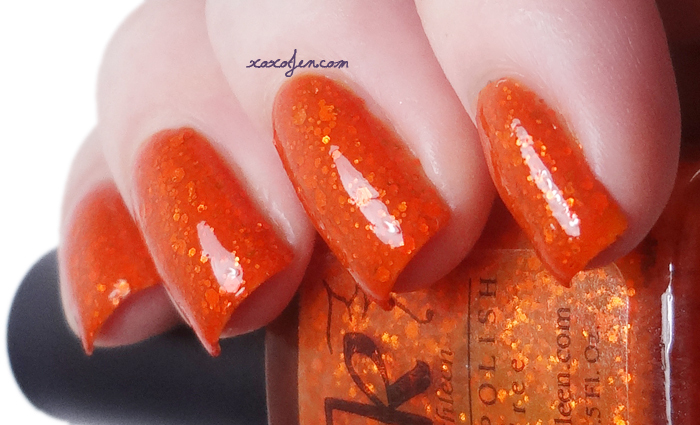 Ciana is a glow in the dark orange jelly full of very fine, and small bright orange glitters. In the dark Ciana glows orangish-yellow after being charged. 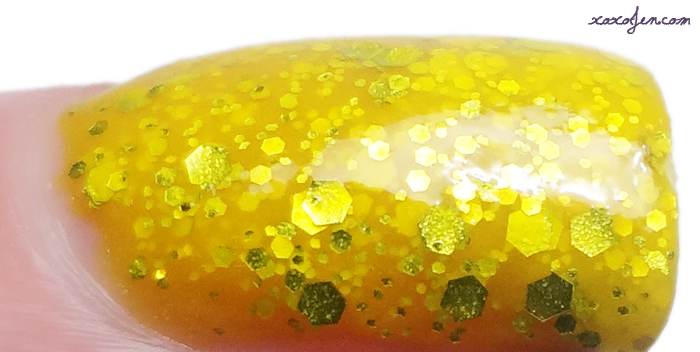 Lumina is a glow in the dark yellow jelly full of very fine, and small greenish-yellow glitters. In the dark Lumina glows yellow after being charged. 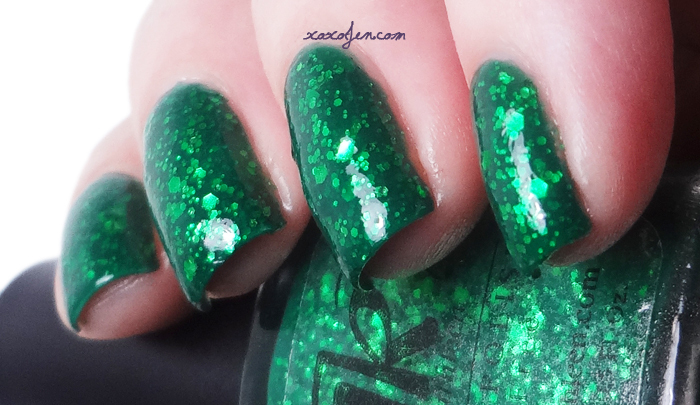 Eliora is a glow in the dark dark green jelly full of very fine, and small bright green glitters. In the dark Eliora glows green after being charged. I'm not great at taking glow in the dark photos but I was able to capture a few pretty well. This is Eliora, it's kind of a tiffany type blue-green when glowing. 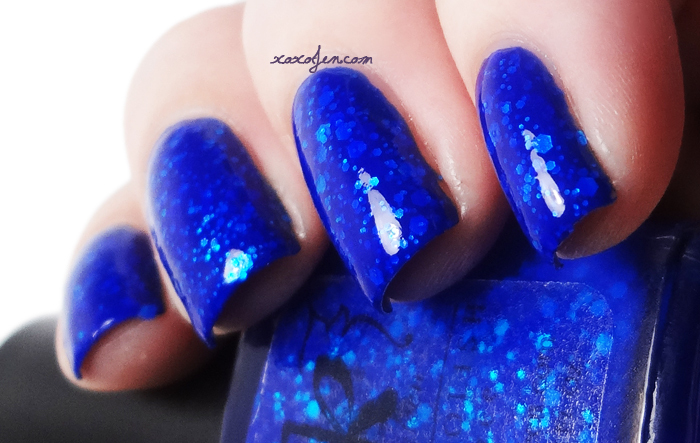 Lenora is a glow in the dark deep blue jelly full of very fine, and small bright blue glitters. In the dark Lenora glows blue after being charged. I was also able to get a good photo of this one, the brightness of the glow on this one is quite bright! Nehara is a glow in the dark deep purple jelly full of very fine, and small bright purple glitters. In the dark Nehara glows blue after being charged. Leanne contacted me before I discovered it, but there was an issue with Nehara's glow and suspension. She has already redone the batch to fix it and is even sending a replacement to me. How's that for customer service? I found the formulas on all six polishes to be good, with a dab here and there to spread a few glitters. The darker colors may only need one coat, but I used two plus topcoat for photos. These and more available at the Anne Kathleen online store. I like the look of how packed and dense the glitters are in here. They're mixed just right I think! What you see there is two coats, if you wanted less glitter you could always do a base color and layer one coat over it. I think white would be an awesome base color for these for even more vibrancy! These are awesome!! They have so much depth! Don't they? I really enjoyed wearing them!